HTC is an underdog in the smartphone space and it has been fighting a tough battle against Samsung and Apple. There’s good news, though: HTC has a focus on developing products and services (see our video on everything you need to know about the One) that it hopes will beat those bigger companies. It offers unique audio, a unique new home screen in Sense 5 and more. Thankfully, too, it’s not entering this battle without hefty weapons. Android is a proven platform, so unlike BlackBerry, it doesn’t need to convince consumers that its software works. The HTC One (see our hands on here) needs to be a hit, though, so does it have what it takes? Yes, I think it does. I spent a few days in meetings with HTC hearing a bit of the back story for the phone. It’s not so much about the hardware, although I think HTC really hit it out of the park with the aluminum unibody design, but about roping in customers for features that can’t be found on other smartphones. Thankfully, the HTC One is chock loaded with those. Take the new Zoe camera with ultrapixels for example. I think the name itself will be confusing to consumers, but there’s a bigger story here. HTC is taking on the entire industry by proclaiming one thing: it’s no longer about the amount of megapixels but the size and quality of them and, ultimately, the sensor included. HTC didn’t stop there. It also added a completely unique experience that it’s calling Zoe. Activate it and, each time you take a picture, the phone will record a 3 second clip of video. This sounds like a gimmick on the surface, but it’s not at all. I love the idea of the automatically generated highlight reels. I can go on vacation to Los Angeles and take tons of photos and then, at the end, have them all come to life in a 30 second reel that I can show to my friends. There isn’t another phone with that sort of technology built in, and I applaud HTC’s efforts to actually change our smartphone experience, not simply build upon it. Instead of adding a plain version of Android, which is admittedly awesome, HTC made a value play with Sense 5, too. Your home screen is now populated with stories, which HTC is calling “BlinkFeed.” You can’t customize them with your own feeds just yet, but you can choose from more than 1,000 unique sources that range from ESPN to large tech sites. HTC even boosted its efforts on the audio front by providing improved microphones for recording high-quality audio in loud situations, such as concerts. Better yet, it included stereo speakers on the front for playing those clips (and music) crisp and loud. I haven’t heard this kind of audio since the Bang & Olufesen BeoCom 5. So here’s the bottom line: HTC has all of its eggs in place to take on the big players, but it needs to show consumers that it can do battle. The HTC One X and the HTC One X+ were fantastic phones, but I don’t think consumers knew it. I think they walked into AT&T, saw the device, maybe played with it then left with another option. HTC needs to put a lot of marketing effort behind the One, and thankfully that’s what we’re told it’s doing. I spoke with a device manager at AT&T today and he said he’s still unsure if it’s going to get the flagship treatment in AT&T stores across the United States, that’s not a great start, but it’s not a deal breaker either. 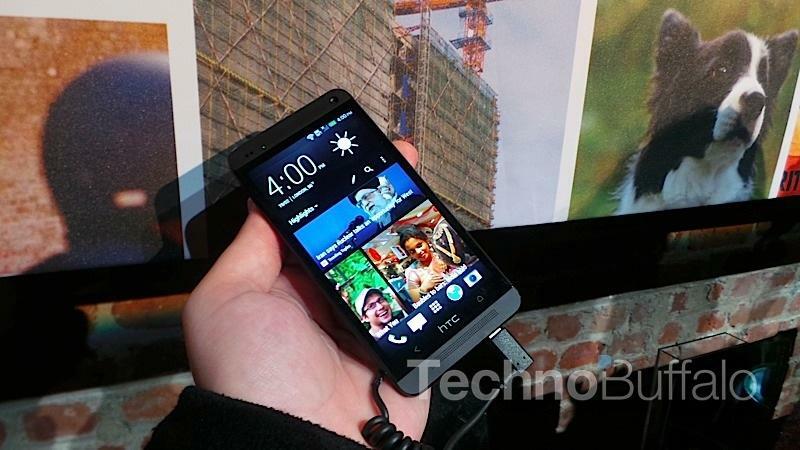 I was pleased to hear today that the One will launch on more carriers than any other HTC smartphone ever. It’s going to land on 185 operators around the world and in 80 regions. That’s great news, and it’s going to at least take some mind share away from Samsung and Apple. I’ll reserve my final judgements for the One until I have a review unit in my hand, but I’m pleased to report that HTC is on the right track, from both a hardware and a software/services perspective. The ball is still in its court, though, and we need to see it execute a slam dunk.